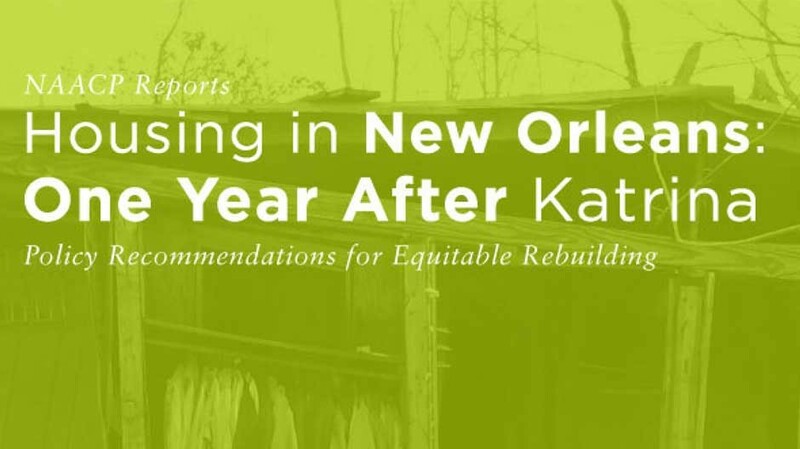 This report assesses the state of housing in New Orleans one year after Hurricane Katrina. It analyzes housing conditions in the city prior to the storm, progress made since, and areas in which the rebuilding effort has fallen short. In addition, it offers practical recommendations to ensure the reconstruction of housing is faster, fairer, and more effective. Housing has long been central to opportunity and the American Dream. Our homes determine our access to schools, jobs, safety, health care, and political participation. They are a source of shelter, pride, and community. And homeownership provides the chief source of wealth building for millions of Americans. In short, fair and affordable housing is central to the very promise of opportunity—the idea that everyone deserves a fair chance to achieve his or her full potential. Our research reveals that the natural disaster of Katrina uncovered and exacerbated existing man-made threats to fair and affordable housing, which have been created by specific policy decisions and years of neglect. The resulting lack of affordable units, low rates of homeownership, racial discrimination, and residential segregation, combined with a slow and uneven reconstruction effort, pose steep barriers to displaced and returning residents hoping to start over. Such characteristics limit residents’ chances of recovering from the storm as well as the entire region’s ability to rebuild.